Whisk the marinade ingredients together. Thinly slice the chicken breasts and marinade for about 15 minutes. 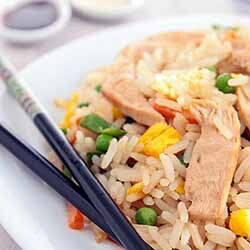 Heat the oil in a fairly large pan and stir-fry the cooked rice until toasty and lightly browned. Remove from the heat. Pour the marinade off the chicken. Stiry fry the chicken strips until just browned. Add the garlic and ginger and stir-fry for a few seconds until fragrant. Add the onion, red pepper and sugar peas and stir-fry until the red pepper starts to soften. Add the sweetcorn and rice and stir-fry until hot. Add the seasoning, stir and heat through. Season with salt and black pepper if required and serve immediately.